After you have invested good money in your new asphalt pavement, then it is only obvious that you would protect it with seal coating. Our professionals at Michael’s Asphalt Paving can not only apply the seal coating for you, but we have the skill to handle all of the maintenance and repairs as well. Michael’s Asphalt Paving uses the best quality seal coating on all of our paving projects. The seal coating is a protective barrier between the pavement and the outside elements. Preventing water from leaking in and creating cracks in the pavement is crucial. Not only do the cracks look bad, but they will begin to expand and cause damage to the pavement. Seal coating will prevent that and will allow the pavement to look like new for many years to come. If there is any damage to your seal coating, we can provide service and repair with innovative approaches that maintain the integrity of the pavement. Our skilled professionals can repair the seal coating and perform any pavement repairs that may be needed to allow your pavement to look like new again. We only use the very top quality asphalt repair products and leading asphalt seal coating technologies to create the best looking pavement around. 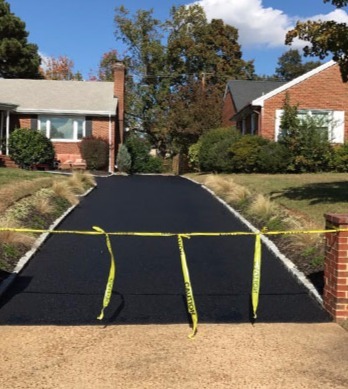 If you have any pavement that does not already have seal coating on it, contact Michael’s Asphalt Paving and we can help to protect your pavement for years to come. By examining you pavement and determining if any repairs are needed, we can assist you in the first step of maintenance. If there is any breakdown in the coating, or if it was applied by another company incorrectly, we can help to rectify that problem and create a maintenance plan that will work for your budget. There is no reason to not have the proper seal coating on your pavement, especially since you invested resources in it, so you need to protect it with a maintenance plan. Advanced seal coating technologies, high-quality, experienced workers, and the very best innovative approaches is what you will get when you contact Michael’s Asphalt Paving. We take pride in creating a beautiful surrounding for you, as well as doing the job right the first time.